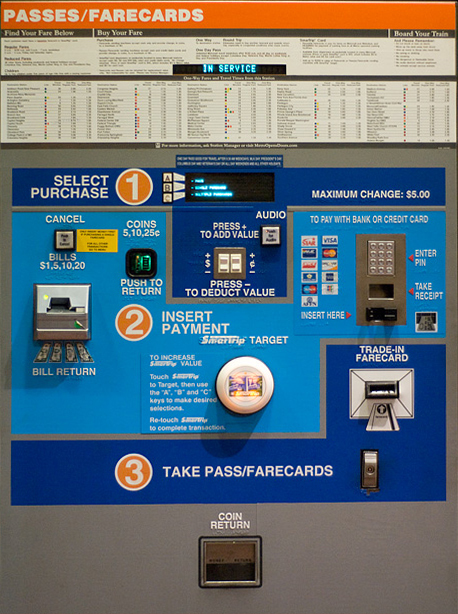 I’ve been a big fan of the Germaphobe’s Guide to Buying a Metrocard in it being an elegant exercise of understanding the design decisions behind the things we use every single day. I decided I’d take a similar exercise to the Tokyo subway ticket vending machines, which in some shape form the backbone of the gargantuan transport system that moves some 8 million people around the city every single day. I’ve decided to focus less on the UI, however, and more on the design of the machines. Though they can appear fairly intimidating to the outsider, several key points make them particularly efficient. Order tolerance – the system can accept coins or passes whenever and in whatever order, which can help limit the available choices in the UI to the things that can be done with what is given. 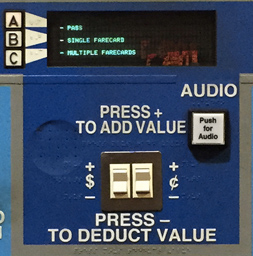 In fact, older generations of the machines had physical buttons with LEDs that only lit up once you put in enough money. This is pretty different from machines elsewhere that only start accepting money after certain steps have been done. Cash is king – even today, credit cards are not accepted for payment, which reduces the time for each transaction, as it inevitably requires entering a PIN (and even perhaps a ZIP code). Drop the coins – if you have a bunch of coins, it’s much easier to drop them into a container rather than into a vertical slot. 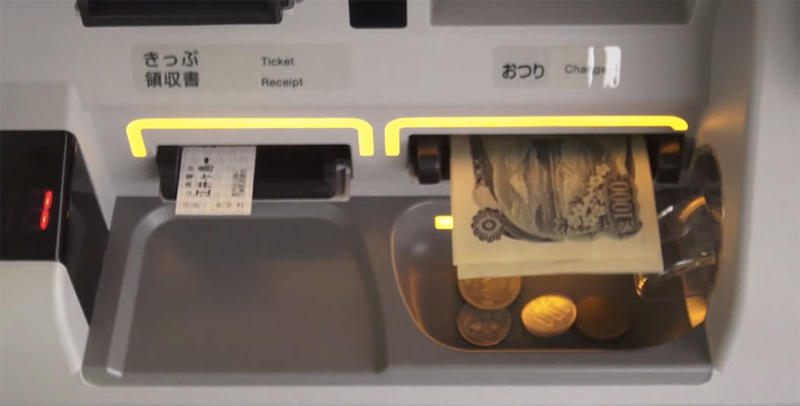 Handle bills elegantly – the machines will return as many bills necessary for change, and accepts up to 10,000 yen notes. 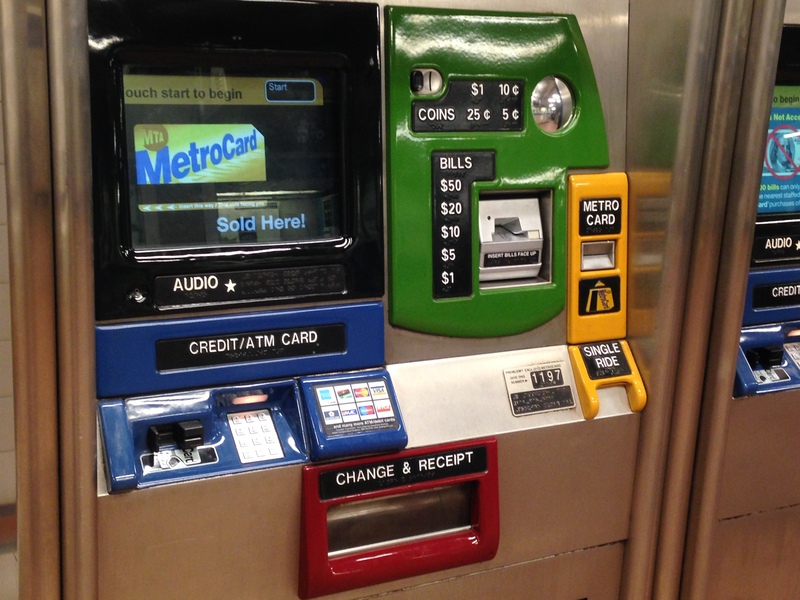 This is in stark contrast to for example the MTA system that will return up to $17.75 in change, but only in coins. Spatial density – the places where you put things into the machine and where you take them out of the machine are all closely spaced. This is undoubtedly tricky to accomplish because multiple machines are required to funnel multiple things and process them all. The machines in Japan accomplish this by making the machine protrude outward, giving more space to hide a coin input and output section. The machine will spit out the ticket, coin and bills in a way that makes them really easy to grab without having to either crouch or fumble around. 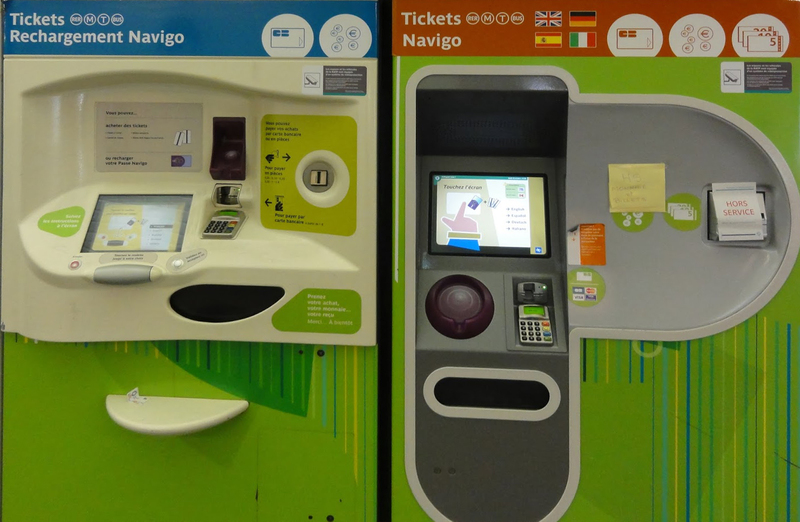 This is unlike most vending machines where both change and ticket come into a common area. Both bills and tickets are “floating”, making them easier to grasp. Also, they’re the more important things you need to take first, kind of like at the ATM. There’s nothing particularly special about this UI, except for the notable omission of any other translation of the interface except English. Many stations have prominently placed route fare maps, though without understanding where to look these maps can be fairly frustrating to use. 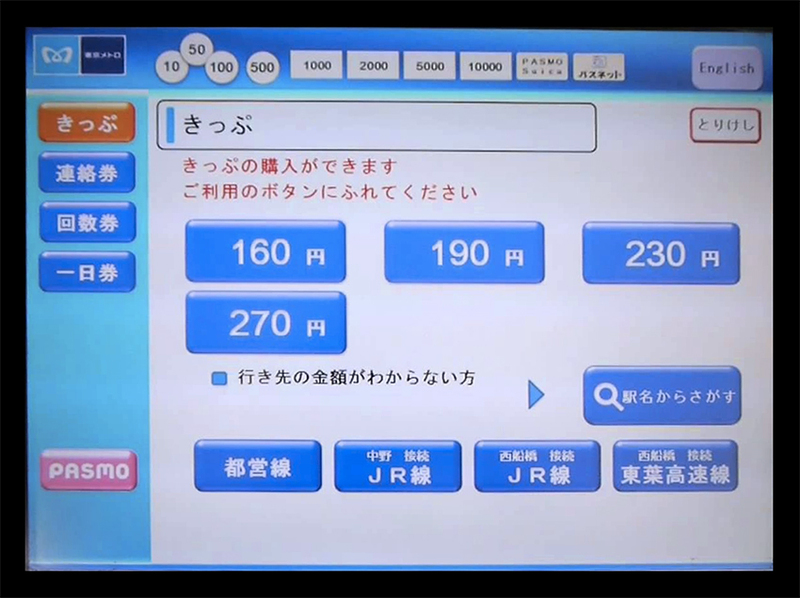 Having understood the expected fare, the user flow is typically as follows. The difference between a “named” and a “nameless” card is that the first flow leads you to enter your name, such that if your card is lost or stolen, the value on it can be transferred over to a new card. Since in Switzerland coins are used for denominations up to an approximate $10 equivalent, most transactions can be done with them, and they feature more closely to the UI interface. But you cannot put coins until the machine is ready to accept them. 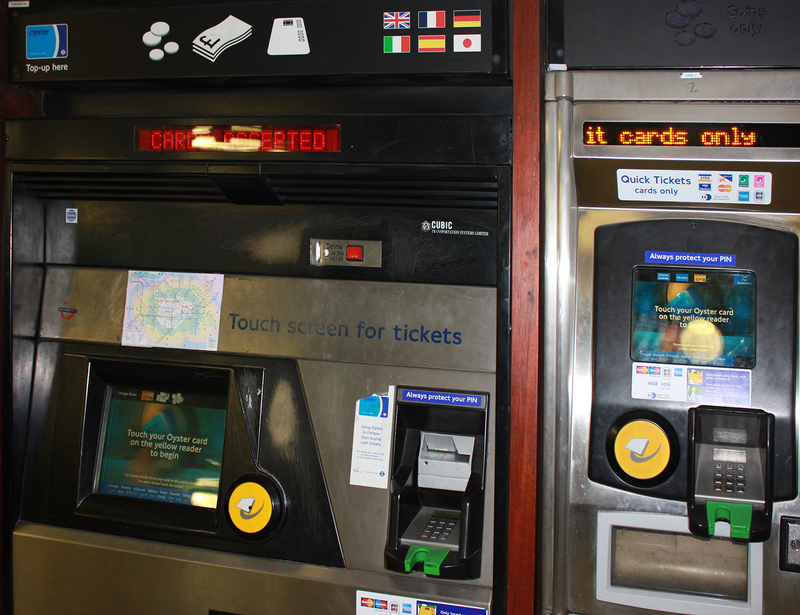 The London Underground is making a big push for use of the Oyster card, and hence its prominence on the machine. There is a small coin entry slot at the top. The unique input mechanism featured in the Paris Metro system is the roll bar, which lets users scroll up and down the UI. Coin input is a bit farther away. 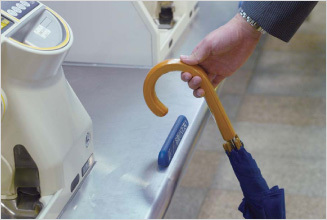 The spot below to put one’s bag is a neat design consideration (though again Japan goes a step further with the umbrella stand, below). The DC metro system suffers from the same ailment that plagues BART — an overly complicated pricing mechanism. As a foreigner, this baffles me immensely. Why does one have to enter the precise denominations for the ticket, down to the cents? Further, an interface with a built in flow diagram is probably not very easy to use to begin with. 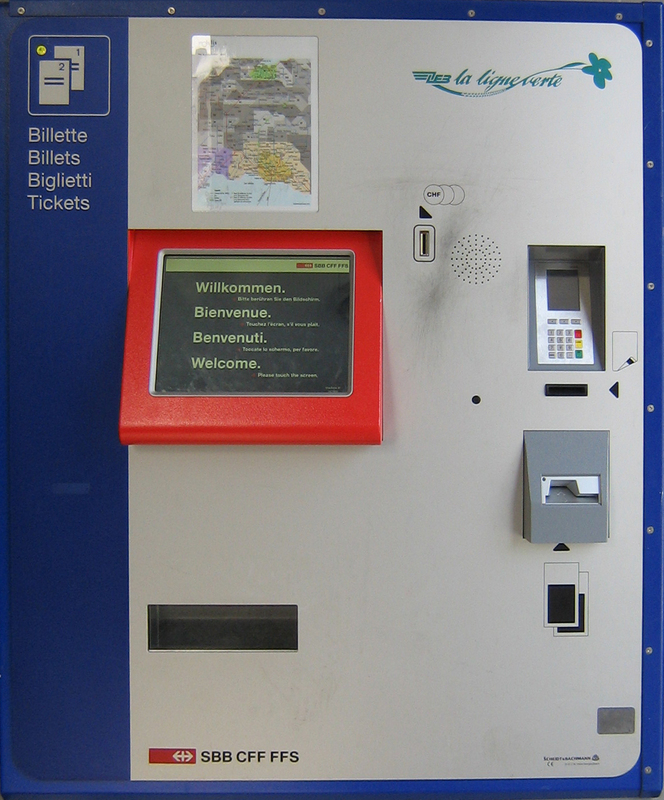 The machine is also a mess in terms of input and output, payment and ticket. Bill return and coin return are very distant, while bill input and coin input are close to each other. Presumably you scan left to right, top to bottom, to accomplish your task. Though this was well-covered in the Germaphobe’s guide, one thing I failed to notice was its color coded sectioning. My hypothesis is that many of the non-Japanese ticket vending machines are built to be easily serviceable and manageable, which means the front of the machine essentially puts together multiple machines in whatever configuration seems most suitable for the market. 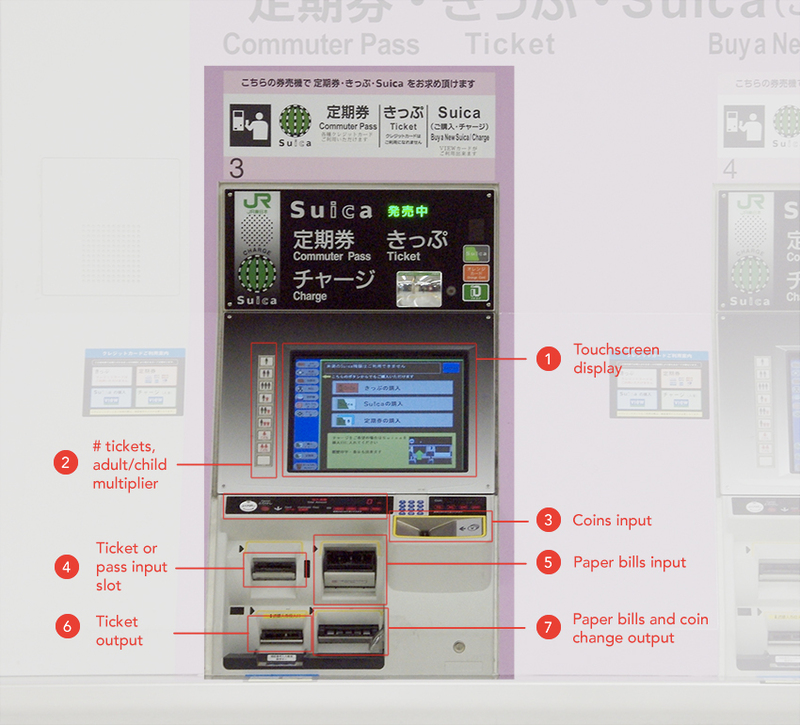 The unique factors in Japanese society — in particular, its hyperdensity and its cash-based economy — reflect well in the machines that stand next to the turnstiles, which has a lot of affordances for the user built in. Use some of these machines while blindfolded. The ten-key input on each machine serves some purpose for the blind, but I’m not familiar with it enough. 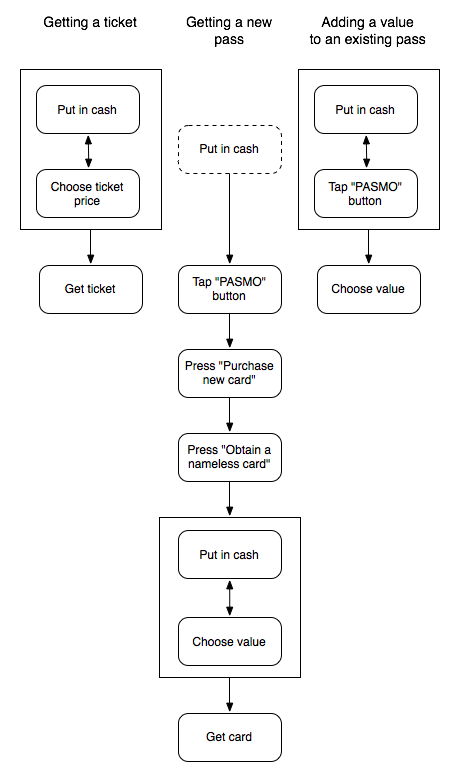 Get a more rigorous approach to timing how long it takes for someone to buy a ticket on average. Measure the machines to see how space (and specifically width) factors into the way they are built. 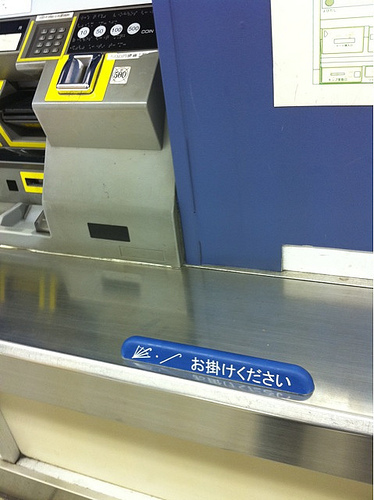 In case you wanted to see something more amazing — what happens if you put a ticket in a turnstile bottom up? This entry was posted on Saturday, May 2nd, 2015 at 12:11 pm, EST under the category of Articles, Photography. You can leave a response, or trackback from your own site.